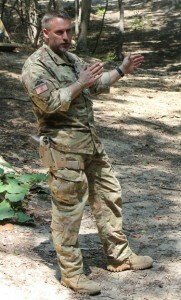 I am now offering private 2 day Combat Team Tactics classes for groups of 2 – 4 people at the MVT Training Facility near Romney in West Virginia. I just got back from running the first of these classes with two students this week.. These classes are private and by arrangement – they do not show on the schedule. The concept is to train small private groups who do not want to sign up for open enrollment classes. This would be ideal for a couple, small family group or small team. These will be two day classes. They will be held at the MVT training site – this is a specific requirement due to the training areas, ranges and target systems necessary to condense the 3 day Combat Team Tactics (CTT) class down into 2 days. This can only be done with a small group of 2 to 4 people. The cost will be total $1800 for the two days for 2 – 4 people. The class will cover most of the aspects of the CTT class with the exception of the squad attack. With two people we will go up to buddy pair level, with 3-4 people we will go up to team level. (The Night Optical Device Firing class can be added if requested – additional cost $200 per person). Due to weekends being so heavily scheduled, this class can be booked during the week. Please contact me to discuss scheduling and your specific requirements. This is a phenomenal idea!! !